What can I send to Latvia? What items are restricted? Tourists flock to Latvia for a myriad of reasons, whether they’re hitting up the bars in the Old Town of Riga for a weekend break away, spending some time hiking amongst the tranquil forests and unspoilt nature of the country’s national parks or sunning themselves on the beach in summer time. Budget airlines are now a popular way of getting around Europe quickly and cheaply. However, you often need to pay for hidden extras, such as checking bags into the hold or if your bags are overweight. If you have a lot of luggage to bring with you, say for a big move to Latvia, getting everything you need into the hold of a plane may be quite tricky. Or, if you are planning on enjoying outdoor pursuits in Latvia and want to bring your own equipment, you may find it difficult to limit yourself to your airline’s weight restrictions. This is where Send My Bag can help. Send My Bag will pick up your luggage, whether its suitcases, bags or boxes, even overweight or outsized items, right from your doorstep and deliver it to wherever you need it in Latvia. It not only saves you money, but also saves you on time and hassle having to wait around at luggage carousels and transport awkward luggage around an unfamiliar country. If you are a student moving to or from Latvia for your degree course, Send My Bag can send all your possessions for you. By shipping your things rather than bringing them on the plane yourself, you can have many more of your things with you and can avoid the risk of excess baggage fees. You can send your luggage and boxes to Latvia with Send My Bag. No matter the reason for your move or trip to Latvia, you can avoid the stress of managing heavy luggage by letting Send My Bag take care of it. This means you can bring everything you need with you without worrying about going over your airline’s weight restrictions. With your luggage taken care of, you can enjoy discovering your new surroundings. To find out more about sending baggage to Latvia, visit our ‘How it works’ page, or our ‘FAQs’. Cycling is a popular way to discover Latvia. You can cycle through historic town centres, along the coast or into woodland. You can do so from the comfort of your own bike by sending your bicycle with Send My Bag. You won’t need to worry about dragging your bike through the airport or onto public transport, as Send My Bag will take care of everything, delivering your bike to your accommodation ready for your arrival. You will also avoid the risk of having to pay oversized baggage fees to your airline. Your bike will need to be dismantled and securely packaged before being sent to Latvia. See our information on bike shipping to learn more. Perhaps not one of the most well-known destinations for ski holidays, Latvia has several resorts offering downhill and cross-country skiing. Resorts include Ozolkalns, Kakisu Trase and Zagarkalns. You won’t have to rent unfamiliar skis when you are there. Instead, you can send your own skis to Latvia with Send My Bag. This is much less stressful than checking your skis into your airplane’s hold. You can send your skis ahead to Latvia and have them waiting for you on arrival. Find out more about sending skis with Send My Bag and read about how to package your skis safely. 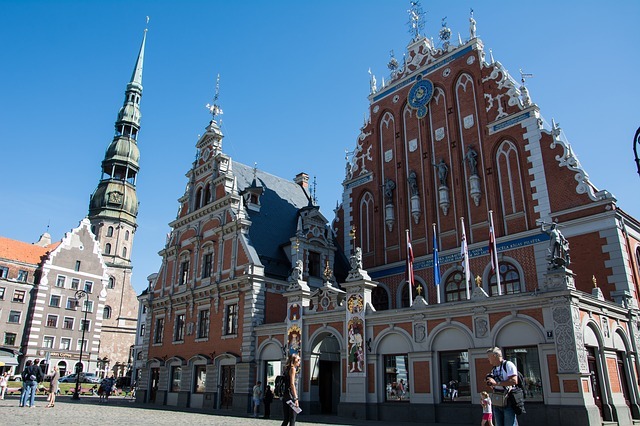 If you are moving abroad to live in Latvia permanently, you will need to consider international removals to Latvia in order to move all of your possessions. Take care to package everything up well and make sure you research removal companies before selecting one with good reviews. If you are taking your degree in Latvia, or if you are spending part of your course there, to conduct research, perhaps, you will have a significant amount of luggage to bring with you. If you send your luggage with Send My Bag, you can bring all your course textbooks, clothes and DVDs, etc. Latvia’s biggest university is the University of Latvia in Riga. Discover more about student shipping on our student page and find out how to receive your student discount. Send My Bag can also send parcels to Latvia for you, which is handy if you have smaller amounts to ship. This is also a great option for friends and family wanting to send you gifts or care packages. When sending a parcel to Latvia make sure you select a sturdy box and seal it up well so nothing gets damaged in transit and make sure you are aware of any duties you may have to pay on brand new items. Read more about sending a parcel and find out what you can send with Send My Bag and how to package your items. If you have big items like a chest of drawers or a nest of tables to send to Latvia, one possible solution for you could be air freight. This is a quick service that can be quite expensive, depending on how big your shipment is. When using a service such as this you will probably need to hire a customs agent to handle customs clearance for you and you will need to arrange the transportation of your items to and from the airports. If sending items internationally by air freight to Latvia your items will likely arrive at Riga International Airport. Sea freight or container shipping is a good option for very large items, like a snooker table or canoe. Sea freight shipping can take a number of weeks, so it’s best if you don’t need to receive your items immediately. This option can be cheaper than air freight, but you will still need to pay for the services of a customs agent and will need to arrange how to get your items to and from the ports. When using sea freight to Latvia, your items will most likely arrive by ship at the Port of Riga. Price was 1/2 of USPS, and made the trip in 3 days door to door east coast us to Latvia. A++++, love this service. Just as you would expect. Easy, efficient and just works! Shipments of Personal Effects will require a copy of the owner’s passport and a copy of their flight ticket to be uploaded to their Send My Bag account to demonstrate to customs that they have travelled, or will be travelling to Latvia from the country they are shipping from. The consignee may also be required to physically visit the Customs Office near Riga Airport to complete clearance, and therefore we highly recommend your shipment is timed to arrive at a similar time to you. Personal effects, which are normally considered to be used items that have been in the sender's possession for 6 months or more, tend not to incur any taxes or duties. This means that most Send My Bag shipments are not stopped by customs. You will need to demonstrate to the customs officials that what you are sending is made up of personal effects. You should do so by completing a short non-generic packing list online, to be written in the following format: "2 x Woollen Jumper, 4 x Denim Jeans, 4 x Pairs of Leather Shoes", and so on, rather than as "10 x Used Clothing". If Latvian customs find brand new or commercial items, customs duties and taxes may be levied. With this in mind, you should check what customs duties need to be paid before you send any Christmas gifts to Latvia. Follow any advice given by local customs and attach all necessary documentation. Because customs processes and allowances vary by country, we ask travellers to take 5 minutes to check how their personal circumstances and what they are sending will be assessed under current Latvian customs regulations. Latvia’s capital city, Riga, is a charming old city filled with narrow winding streets covered in cobbles. Many tourists spend their time in the city exploring these streets and uncovering the history behind them in the beautiful squares that are home to sights such as the Dome Cathedral. It’s also a fantastic place for shopping, whether at markets or small independent boutiques. It has a nearby seaside resort, Jurmala, and a booming nightlife in the Old Town that draws hen and stag dos from across Europe to taste the local beers and enjoy the friendly atmosphere. Outside of the city, you’ll find Latvia to be a stunning place with plenty to keep tourists occupied. The coastline boasts some of the best bird watching in Europe with Liepaja on the Kurzeme coast being on sea bird migration paths and home to songbirds and raptors too. Hiking is an exceedingly popular past time in the gorgeous Gauja National Park, which has a river, caves, dense woodland, and lots of wildlife. It also draws tourists with the promise of exciting water sports such as white water rafting and river kayaking.